The term “supergroup” gets thrown around on a regular basis these days, however, GENERATION AXE undisputedly brings together some of the greatest guitarists of all time. Steve Vai, Zakk Wylde, Yngwie Malmsteen, Nuno Bettencourt, and Tosin Abisi once again will join together to tour North America to stage 32 appearances across the country. Beginning on November 7 at the Fox Theater in Oakland, CA, the run will return to markets where the inaugural tour was celebrated and hit several new cities for the first time. The general on-sale goes live July 13. Making this rare tour experience even more special, Generation Axe VIP packages will be offered, giving fans access to these guitars masters and exclusive one-of-a-kind memorabilia. A front row package (including a meet & greet), a meet & greet package, and a VIP tour package will be available. For more information, visit www.generationaxe.com. 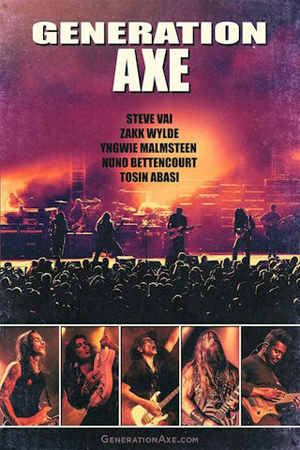 Generation Axe - A Night of Guitars is produced by Copeland International Arts and is booked by CAA. For additional information visit: www.generationaxe.com.